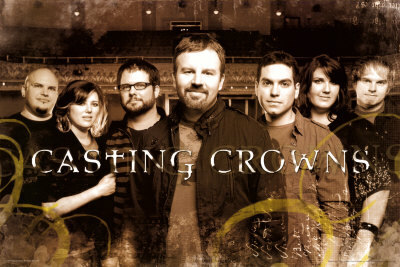 Casting Crowns is a Grammy Award and Dove Award winning Contemporary Christian/Christian Rock band. Casting Crowns was started in 1999 by youth pastor Mark Hall at First Baptist Church in Downtown Daytona Beach, Florida as part of a youth group. He now serves as a lead vocalist. Later they moved to Stockbridge, Georgia and more members joined creating the band now known as Casting Crowns. Some members of the band currently work as ministers for Eagles Landing First Baptist Church in Stockbridge, Georgia. * Inspired by Jesus’ encounter with the woman at the well, Casting Crowns encourages you to let the “living water” of Christ overflow to those around you. Includes “Courageous,” “City on the Hill,” “Already There,” “The Well,” “Spirit Wind,” “Just Another Birthday,” “Wedding Day,” “So Far to Find You,” and more; plus a FREE black T-shirt (size large; while supplies last) with band name. Inspired by the story of Jesus’ encounter with the woman at the well, Casting Crowns encourages you to let the “living water” of Christ overflow to those around you. Includes “Courageous,” “City on a Hill,” “Already There,” “The Well,” “Spirit Wind,” “Just Another Birthday,” “Wedding Day,” “Angel,” “My Own Worst Enemy,” “So Far to Find You,” and more. The 2010 Dove Award Artist of the Year winners are on tour—and you’ve got a front-row seat! The live concert DVD features stadium tracks, teaching sessions from Mark Hall, the title track music video, and behind-the-scenes stories. The CD includes “If We’ve Ever Needed You,” “Glorious Day,” “Mercy,” “At Your Feet,” “To Know You,” “Holy One,” and “Blessed Redeemer”. To the members of Casting Crowns, worship is more than songs—it’s the fabric of their lives! Includes “Stained Glass Masquerade,” “Set Me Free,” “Prodigal,” “Love Them Like Jesus,” “Praise You in This Storm,” “In Me,” the title track, and more. After rising from the thriving Atlanta music scene to become one of CCM’s top bands, Casting Crowns follows up their string of Platinum selling albums with The Altar and The Door. Perfectly encapsulating their seamless blend of adult contemporary and worship styles, the group’s hotly anticipated third studio album includes the radio hit “East to West” plus nine more fresh original compositions. Platinum Crowns on tour—and you are there! CD includes “Praise You in This Storm,” “Love Them Like Jesus,” and “Stained Glass Masquerade.” DVD features “Lifesong”; “Father, Spirit, Jesus”; and the music video “Does Anybody Hear Her.” Plus you get behind-the-scenes tour footage, band devotions, lead singer Mark Hall’s typical day, and lots more! Mastertrax Premium Collection is the new collection that brings you 5 different original artist performance track masters – all on one CD! This CD includes the original key soundtracks for 5 hit songs from Casting Crown’s album Come To The Well. Features four songs with and without background vocals, and one without Background Vocals. Lyrics and sheet music enclosed. Casting Crowns’ 2003 debut has become one of the biggest-selling Christian albums of all time. This special Gift Edition of the album features a bonus DVD containing the original behind-the-scenes story of how Casting Crowns got its start, live performance footage of the No. 1 radio hit, “Who Am I,” the “American Dream” music video, and more.